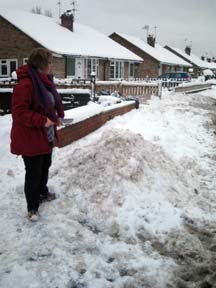 I feel we have had too much snow now, for the more than 3 weeks it has snowed here in the UK we are lucky usually just to get a couple of days this is me yet again having to dig our drive out. Here is a picture of what I have done so far on the Birth sampler I started in the middle and have stitched right across the middle now, I love the paw prints in the boarder, I shall put his Name and other details in last as I have not charted them yet. 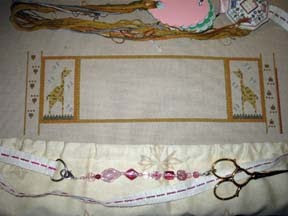 Your birth sampler looks so sweet! The paw prints are really cute. Lovely progress on your sampler btw. Beautiful.